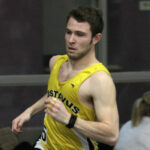 The Gustavus men’s track & field team is set to compete at Saint John’s on Saturday. The meet starts at 11 a.m. at the Donald McNeely Spectrum and will include Concordia-Moorhead, Gustavus, Minnesota-Morris, Saint John’s, Division II Sioux Falls, and Division II Southwest Minnesota State. 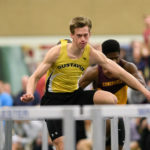 The Gustavus men’s track & field team competed at the St. Olaf Quadrangular on Friday and captured two individual event victories along with three more top-three performances. 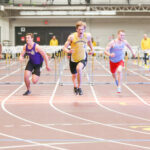 The Gusties won the 60-meter hurdles and the long jump. 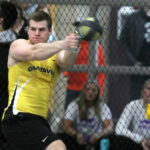 The Gustavus men’s track & field team is set to compete at the St. Olaf Quadrangular on Friday evening. 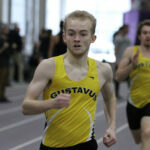 The meet starts at 4 p.m. and includes Bethel, Gustavus, St. Olaf, and St. Thomas. 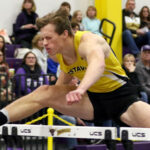 Gustavus track standout Taylor Rooney (So., Andover, Minn.) has been named MIAC Men's Track Athlete of the Week for his performance at Macalester's Vanessa Seljeskog Classic on Friday. 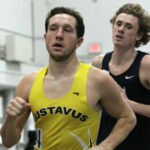 The Gustavus men’s track & field team Friday claimed second place at Macalester’s Vanessa Seljeskog Classic, totaling 63 points. 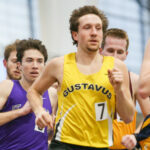 Bethel won the meet with 70 points and Macalester took third at 37. 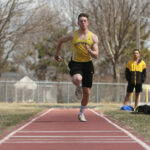 The Gusties took home six first place finishes along with eight second place finishes.